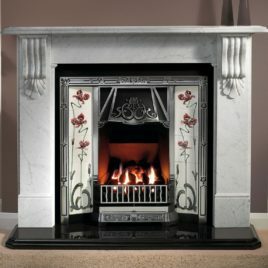 The Tradition insert is an elegant and high quality fireplace insert. 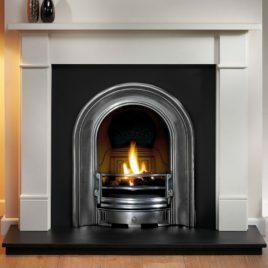 Crafted from high quality cast iron, the black frame offers a dark backing that provides a congenial contrast of ambient fireplace colours. This makes for a perfect area to cosy up to the fire and read a book or to entertain guests by the firelight. Versatility is an area where the Tradition Cast Iron insert shines brightly. 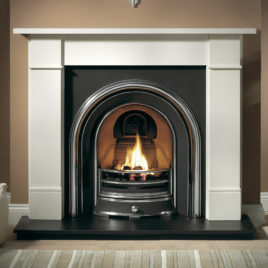 It can be used with solid fuel, decorative gas burners, or electric insert. The fireplace’s adaptability is paralleled by its substantial longevity. The Tradition is a perfect piece of decor for any fireplace and can even be used with a hearth. 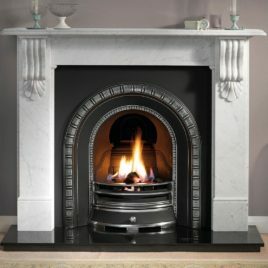 It is a multipurpose insert that does not force consumers to compromise between the most important features of their fireplaces. When it comes to fireplace inserts, functionality and beauty are both part of the Tradition. 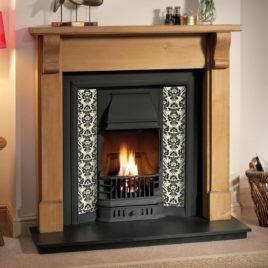 The Tradition insert is an elegant and high quality fireplace insert. 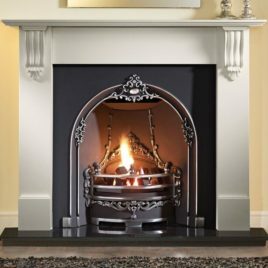 Crafted from high quality cast iron, the black frame offers a dark backing that provides a congenial contrast of ambient fireplace colours. This makes for a perfect area to cosy up to the fire and read a book or to entertain guests by the firelight. Versatility is an area where the Tradition Cast Iron insert shines brightly. 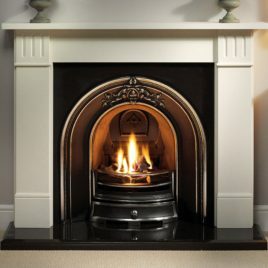 It can be used with solid fuel, decorative gas burners, or electric insert. The fireplace's adaptability is paralleled by its substantial longevity. The Tradition is a perfect piece of decor for any fireplace and can even be used with a hearth. It is a multipurpose insert that does not force consumers to compromise between the most important features of their fireplaces. When it comes to fireplace inserts, functionality and beauty are both part of the Tradition.